The deal â" under a â2+2â scheme where technology will be transferred to an Indian shipyard to construct two of the frigates from scratch â" has been in the works since 2015. Russia has inked a $950 -million deal to supply two new warships to India that will be equipped with Brahmos missiles to add to the firepower of the Navy. The two frigates of the Project 11356 class will be bought directly from Russia and a contract to build two more at an Indian yard is likely to be signed at a later stage. Sources told ET that while final clearances for the long-pending project came before the summit earlier this month between Pr esident Vladimir Putin and Prime Minister Narendra Modi, the deal was signed last week after price negotiations. Given that the US has implemented sanctions on weapons purchases from Moscow, India could make payments for the ships using the rupee-rouble route. The deal â" under a â2+2â scheme where technology will be transferred to an Indian shipyard to construct two of the frigates from scratch â" has been in the works since 2015. The two ships to be brought from Russia are expected to be delivered by 2022, given that the hulls have already been fabricated for a Russian navy order that got stalled following the Ukrainian crisis. The ships have been designed to work with Ukraine-made gas turbines. 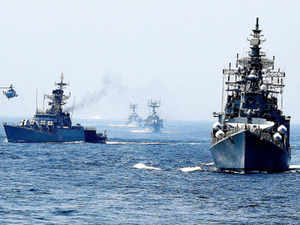 The two frigates are likely to be brought to India after construction to fit the gas turbines at a local yard as the order for turbines has been placed directly by New Delhi with Ukraine, to bypass any complications given the Ukraine-Russian relations. There had been initial discussions to involve the Indian private sector to build two of the ships but the government decided to nominate state-owned Goa Shipyard. It is not clear if the decision still stands or the ministry will follow a competitive process to determine the local partner. The Goa Shipyard has been facing financial stress and has not been able to go ahead on an earlier order for new minesweeper vessels that are desperately needed by the Navy. The process to acquire the minesweepers has been aborted twice and an attempt is now being made to issue tenders for the project. Here are some personality shifts by Desi parents on Diwali.